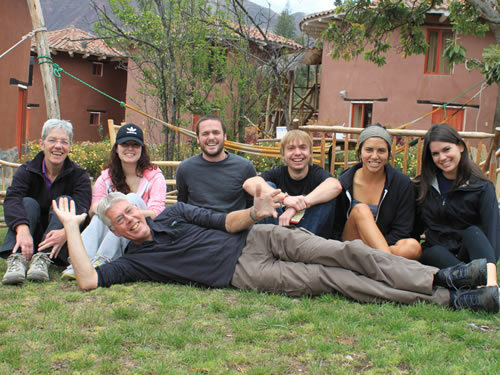 Yanahuara is a small village in the heart of the Sacred Valley, next to Urubamba, where one can experience true immersion in the Peruvian lifestyle and learn the beautiful Spanish language at the same time! Engage with the local people in Peru that live in this quaint little town out in the Sacred Valley, learn Spanish quickly and take part in experiencing the true life of Peru, at only a few kilometers of the Inca ruins of Machu Picchu! Yanahuara is about a 90 minute bus ride from the town of the capital of the formar Inca Empire Cusco. The climate is warmer than in Cusco due to the lower altitude (2800 meters) and is a lovely spot to study Spanish and to enjoy the relaxing and tranquil atmosphere that this valley provides. This is the perfect place for a total Spanish immersion and experience the stunning beauty of this impressive valley. Our Spanish School is located about 15 minutes bus ride from Urubamba and Ollantaytambo, with beautiful views of snow peaked mountains and typical houses. While studying at our language school, students can sit back and relax into their studies. With the surroundings of the majestic mountains, the sounds of the babbling river, and the smells of campfires in the distance, students will leave the village only wanting more of what they just experienced. Interesting extracurricular activities such as a traditional Andean ceremony with an inca shaman as well as lectures about Inca cultur and excursions to impressive ruins and tourist attractions. There are also excellent options for volunteer work in the region. Machu Picchu and the Sacred Valley is one of the most impressive, rich and spiritual places on earth where ancient cultures combine with breathtaking scenery. For those who are interested in volunteering, there are so many opportunities to put your language and your cultural experience into practice.